What were your biggest concerns when contemplating transitioning into P3? Well, I had great success during P2 but I felt the cooking was more basic & that met my skill-set. Before starting HCG, I was like a Betty Crocker, without the Crocker. Everything else in my household was always creative & unique…Except my cooking. Through P3ToLife, my skill-sets & confidence has flourished! As I was transitioning into P3, I had hesitancy about the guess-work, lack of knowledge to create a variety of recipes, & over­thinking every single nutritional value. I was actually referred to you during this hesitant discussion from New Beginnings, the medical spa that I originally began with & am still continuing weigh-in’s, through my protocol. As soon as I found YOU, it was like a SEMI-TRUCK was lifted off my shoulders! 🙂 Seriously! How did you end up following the P3ToLife program – Original, Simplified, or Build Your Own? Did you tweak to one of these? Can you give a few details of how you utilized the program & tailored it to yourself & circumstances? I told myself ahead of time that I would try the Original Plan. Ends up, my 1st week of P3, I decided to do the Original Plan because I thought it would be a smart choice since P2 was more strict & it would be a kick-start to the P3 phase. If there was a favorite dish from the past, I incorporated it sensibly, like the muffins! Did you have to do any correction days during P3 this time & if so what do you think was the cause? How did the correction go? I had zero correction days! I felt that I had zero because I stuck to your plan & if there were ever a time that I “needed” more just because we are human BUT …I made sensible decisions. I made those sensible decisions through consulting with my mentor at NB & your coaching tutorials. Ex: “Change How Your Body Talks To You”. In a nutshell, can you share your tangible results from the P3ToLife Program? How has your weight been while following the program? My weight-loss has been soaring! I’m down 21lbs! Some days have fluctuated naturally due to fluid, water retention on monthly cycles, but I have not let that discourage me. I remember hearing this from both you & my support at NB so that advice really stuck with me. I’ve realized that if the scale looks slightly “off” it’s due to a natural body cause, not because of a choice that I made! I also promised myself to understand that some weeks may show more weight-loss/less inches & the following week, the opposite. That helped me not to sweat the small-stuff & focus BIG picture because I knew if I was following P3ToLife, there was NO grey area. How do you feel about the portion sizes & taste of the P3 meals? Did the portions & meals make any difference in how you felt about the eating/relationship with food while on P3? If you still felt hungry, how did you adapt to add calories? The variety = Overly satisfying! I genuinely can’t wait & look forward to my meals. Honestly, I feel that there has not been a struggle with eating because & I have felt very fulfilled & prepared. My day just runs smoother. I’m not saying I don’t crave amazing pizza, but ya know what? I’m happy with a Meatza Pizza from HCGChicarecipes! 🙂 Sure, there is prep-work involved but that’s with anything that involves long-term success. A healthy routine in general sparks positive endorphins & mindset. I very rarely felt hungry but if I did because of a good work-out (kickboxing), I made sensible decisions. Organic Egg Whites (In Bag; Already peeled) Remove yellow; replace with a scoop of avocado, red pepper flakes & dash of Tabasco sauce. Broccoli florets, cherry tomatoes halved, a teeny dash of organic feta crumbles, low-cal/low sugar tsp of Balsamic. Snack of low-sugar fruit; blueberries, blackberries, strawberries….Add Walden Farms’ chocolate dip if you need the umph! P3TOLIFE Muffins! Batch these babies! Leftovers from when I was full before the portion was completed. Extra cup of coffee – Using Truvia & Walden Farms creamer (Mocha my fav). Can you share a little about your personal life- i.e： Work full time/ part-time, kids, hubby, or school? Would love to hear how made the logistics work out with cooking the program with whatever time constraints you deal with. How did you manage to fit in preparing the meals with your schedule each week? Prior to starting HCG, I was very concerned about this. I am a single Mom of the sweetest 6 y/o boy, Bledin. He is my #1 buddy…Down for trips to grocery & last minute walks to decompress LOL. However, I am STRETCHED-THIN. I am a full-time professional in a demanding career in the Pharmaceutical industry with a lot of windshield time. So managing my work-life, social-life, his life, his school, pets, household….then ADD cooking, I was a little discouraged. P3ToLife for me was generally 4-7 hours of cooking per week. I got a great idea to hire someone & highly recommend seeking a friend or assistance from care.com. There are many skilled friends/people that enjoy cooking & just want to make extra money in their flexible schedules but at a very affordable rate. Plus, the guess-work of them creating a meal-plan is absent. Sometimes, I cook on my own depending on time constraints & sometimes I have help & it cuts the time in half. Sometimes I am home, sometimes I am away, & sometimes I assist. Either way, food is prepped, time cut in half & I’m flourishing my skills! Also, a BIG component is understanding the big picture & the VALUE of YOUR time. Obviously, you have to prep or the likelihood of success drastically diminishes, but does it really make sense to put others things off that are more valuable than cooking when you can possibly afford to fit this into your budget short or long term? Understanding this can be a BIG WAKE-UP call. This is what lead me to this decision. Also, I created a nicely organized binder for long-term use that made my grocery shopping & cooking simplified for myself & the person assisting. Were there any positive results from following the plan that surprised you that you weren’t expecting? Have you learned anything new from the program? Yes, 21lbs! I was not expecting to lose so much! Also, I now like all sorts of new healthy foods. I NEVER liked mushrooms, now I do. Also, I have better knowledge of nutritional labels & it’s nice to have an overall mindset that healthy recipes can still be so flavorful & delicious! Also, I am pleased with my confidence in the kitchen & that’s irreplaceable because it was once a big fear. What were one or two of your favorite recipes? LOVE – All the muffins and/or mug cakes! Breakfast is my favorite meal & I feel it really sets the preface for the day. I really enjoyed the Bacony Egg Cups, Lemon Mug Cake (I made muffins), & Blueberry Lemon Muffins. For main meals, I LOVED the Creamy Sun-Dried Tomato Chicken with Garlic Kale (Week #4) & Indian Curry Chicken (Week #1). LOVE the smoothies as I’m a sweets person & I can’t pick a fav! Was there any coaching section you found useful or that resonated with you & how so? I really enjoyed the brain-tease: Small Plates! This is so true & a great mind-shift when making such major lifestyle changes with the HCP protocol. This is perfect for P2, P3, & life-long. Any other closing thoughts that you want to share about your experience with the program or that might help others consider whether or not to give it a try? 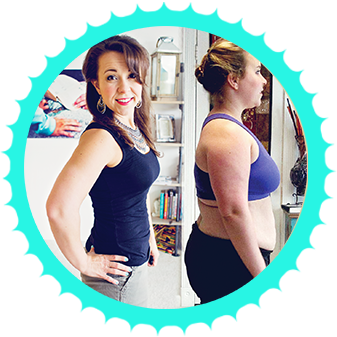 You know that overwhelming feeling when you’ve lost all this weight but you’re so scared to make a mistake to the point that you over-think things & drive yourself nuts….Up until you finally get more conditioned & experienced with making better decisions? P3ToLife eliminates all of that, even down to the grocery list! P3 should be about celebrating success & transitioning into a new chapter, not worrying or making life more complicated for yourself. How much do you value your time? How much do you despise over­thinking grocery store labels & what pairs with this & that? The list goes on! This program provides staples that you can enjoy solo or with your family. It is worth every penny + more simply because of all the life- factors that are satisfying. For me, it was a NO-BRAINER! You have nothing to lose (maybe a few extra lbs 😉 & only PEACE of MIND to GAIN! hCG Injections. 150 iu for all weeks EXCEPT my final week, I used 200 iu from New Beginnings Medical Spa. Have you ever used Lipo shots or B12? If so, what do you think of them? Lipotropix 1ml – 3x per week (M/W/F) = GAME CHANGER! Between the appropriate nutritional value, I receive from P3ToLife + the Lipo shots, it truly was a game-changer for me & helped me push-thru. I plan to continue this long-term. P3： BioCitrin (Garcinia Cambogia) with Bioperine: 2 caps daily @ lunch/dinner. I only have about 20 pounds to lose and I am having a difficult time. I have tried HCG and I have a hard time staying on the 500 calorie diet. I did the 5,000 at 175iu and it certainly isn’t working well for me. This was my 4th time. At one time many years ago, my doctor gave me a prescription of 10,000 at 200iu inject and it worked well. I lost 6 lbs in one week. Of course then you could get it from your doctor , but not anymore. I see you cannot get that amount any longer. I do take injections of B-12 from my doctor. Any suggestions would be helpful. Did you mean you used 10,000iu? Could you remember with how much solution was it mixed? Was it 10ml? Your dose also depends with how much solution you diluted the hCG with.